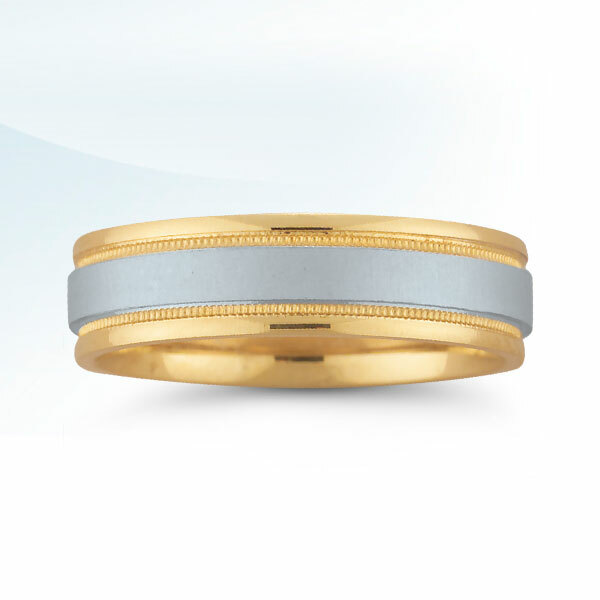 Novell two-tone men's wedding band style NT01084 is 6mm wide, but can be created in a variety of widths and thicknesses. Almost all Novell wedding bands can be specially made in other metals, including platinum, palladium, gold and Argentium Silver. Novell does not sell directly to consumers, so please contact an authorized retailer in your area to obtain a price. All Novell wedding bands are handcrafted in America. Every ring is made to order, so please allow up to ten working days for your order to be completed. However, rush service is available by request. Ask your Novell dealer for more information.